Holding up pieces of schistic rock from a vineyard south of Montalcino, Stefano Ruini notes how Burgundy's ancient Cistercian monks would taste soils to understand terroirs. "I am more of a Cistercian monk than a hipster," jokes Ruini, the new technical director of Luce della Vite, one of several Tuscan estates owned by Italy's prominent Frescobaldi family. 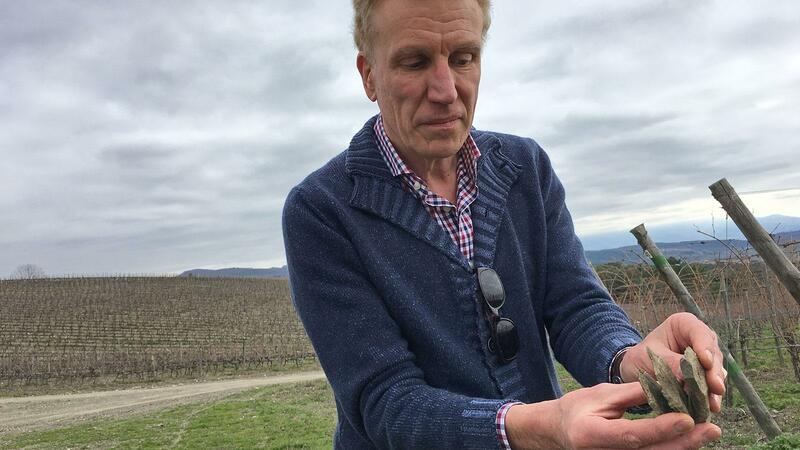 Ruini, 57, a French agronomist and enologist who worked extensively in Bordeaux, wants it to be known he is a classicist who puts vineyards first—not someone who chases trends or relies on corrective tricks in the winery. "I am not a winemaker," he says. "I see myself as more of a midwife." The hiring of Ruini, along with the establishment of a new cellar dedicated to Luce wines, represents a new era for this brand founded in 1995 as a partnership between the Frescobaldis and California vintner Robert Mondavi to create a super Tuscan blend of Sangiovese and Merlot. Other wines followed: A second blend, Lucente, debuted with the 1995 vintage; 2003 was the first for a Brunello di Montalcino. After the Mondavi family sold their wine company in 2004, the Frescobaldis took control of Luce della Vite and continued producing the wines at their Castelgiocondo winery, adjacent to the Luce vineyards. But as part of a recent move to make the company's estates more independent, Frescobaldi chief Lamberto Frescobaldi wanted to give Luce its own team and winery. "As the Marchese Lamberto told me, 'Luce is grown up now; it is time for it to have its own house," says Ruini, who was hired last year. "He told me we have to work not for maximum profit, but for beauty." Lamberto Frescobaldi had planned to build a winery for Luce. But then he learned that his neighbor—a Swiss investor with no background in wine—might be willing to sell his modern 2011 winery set under a stone farmhouse, along with about 25 acres of vineyards. Frescobaldi was happy not to mar the landscape by excavating another cellar and closed the sale in early 2017, bringing Luce's vineyards to about 215 acres, all farmed with sustainable practices. Enter Ruini, who went to work setting up his dream winery. "With two years of aging in barrel," says Ruini, "I don't want to add more wood. Concrete is neutral. Steel has a reducing effect on wine—it's not the best." In the same vein, Ruini has decreased the number of barriques used for aging Sangiovese, focusing instead on large oak casks. "Sangiovese is a gentleman. He is discreet, you have to respect that," says Ruini, adding that aging in large casks "is a long, gentle process." All these steps are meant to bring out the nuances in grapes from southern Montalcino soils that vary from sand and limestone to clay and schist. "If it's possible to increase quality with expression of terroirs, that's my commitment," he says. "It's an evolution, not a revolution." Ruini, the France-born son of an Italian father and Swiss mother, has spent most of his career in Bordeaux, serving 13 years as director of Pauillac's Château Haut-Bages Libéral. After leaving that post in 2011, he worked stints as an estate director in Corbières and Cahors. Then he moved to northwestern Italy's relatively obscure Oltrepò Pavese, attracted by the chance to work with Pinot Noir and Chardonnay, Burgundy's principal varieties, with a long history in that area of Lombardy. "It was interesting for me," he says, with a laugh, "because in France, when you come from Bordeaux, it's not possible to get a job in Burgundy." Then the call from Frescobaldi came, starting what Ruini calls the "opportunity of my life." He now lives on a gorgeous Tuscan hilltop above the winery, has a budget to develop Luce independently and a boss committed to investing in quality. Although his first vintage here, 2017, was so hot and dry that it was "the toughest of my life," he is optimistic about the final result. "This craft is humbling," Ruini says. "I am here, as we say in France, to put my stone in the wall."